WhatsApp had recently launched the much-awaited feature group calls for voice and video. 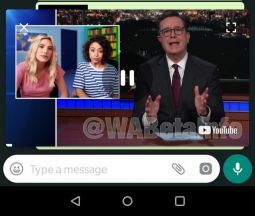 Now, the messaging platform is working on a feature called Picture-In-Picture (PIP) mode for Android. 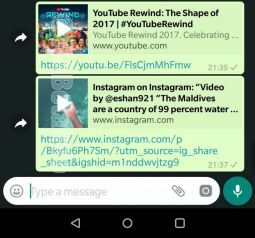 The PIP feature will allow its users to continue their video calls or watching videos on a small window while chatting and browsing in WhatsApp (without the need to exit WhatsApp). Currently, YouTube videos do not play within the WhatsApp app. To play the videos, users are redirected out of WhatsApp to a browser or Youtube app to play the sent video. The way this feature works is that whenever a YouTube video is shared in a chat, its “thumbnail preview” appears with a Play button on it that lets you play the video in PIP mode which reduces the video player into a small, floating window that can be moved anywhere on the screen. This allows you to continue watching a video while also navigating through the app and chatting with your friends. This is a cool feature for those that find it boring to hop into YouTube’s or Instagram’s apps to quickly view a clip sent by a friend on WhatsApp rather than just watching it in the WhatsApp app whilst they are chatting with their friends. There’s no word on when this feature will be available for all WhatsApp users on Android, but, given the fact that it’s still under development, we can expect it to be rolled out to all users within coming months.